Before 1981, the Bengals wore uniforms similar to their Ohio counterparts in Cleveland because Paul Brown, the founder of the Bengals and former coach of the Browns, wanted to field his team in uniforms similar to the Browns. The uniforms were boring and uncreative and didn’t even have TV numbers on them. After 1980, they were scrapped in favor of ones that I thought were great. The helmet is no doubt the best in the NFL, what’s cooler than tiger stripes on a helmet? I liked the uniforms they had from 1981-2003. The ones they have now are too busy and have too much on them, but the ones before them were awesome. 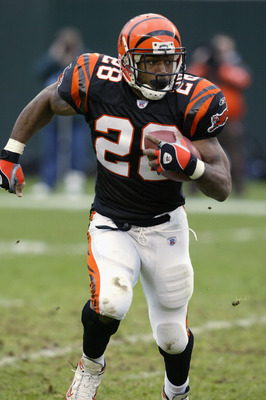 The black jersey with the shoulder stripes on them were great as well as the pants stripes with all the bengal tiger stripes. The team found success not long after the uniform change, but a team that made it ahead of them on the list derailed their Lombardi Trophy dreams not once,but twice. The San Francisco 49ers won five Super Bowls from 1981 to 1994 an they did it in some of the best uniforms in NFL history. The gold helmet, the red jersey and the gold pants with the wide stripes on them and the red striped socks just screamed Super Bowl success. 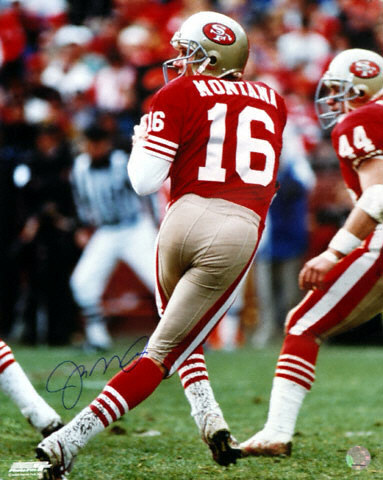 When you saw this uniform, you saw Montana throwing it to Dwight Clark in the back of the end zone. You saw Steve Young running out of breath to bear the Vikings defense for a touchdown. You saw Jerry Rice scoring touchdowns in the Super Bowl. How beloved are these uniforms? In 1991, the 49ers announced a logo and uniform change which caused an uproar among fans. So much so that the idea was scrapped the next day. However, five years later in 1996, the 49ers would go to a darker red with shadow numbers and white pants. The combination was not as popular with fans and in 2009, a new version of the classic 49ers uniform was introduced and is a big hit. I know you’re thinking it’s because I like the color orange that these are on the list, and that’s probably part of it. But the Buccaneers’ uniforms from their early days were actually a pretty classic look. 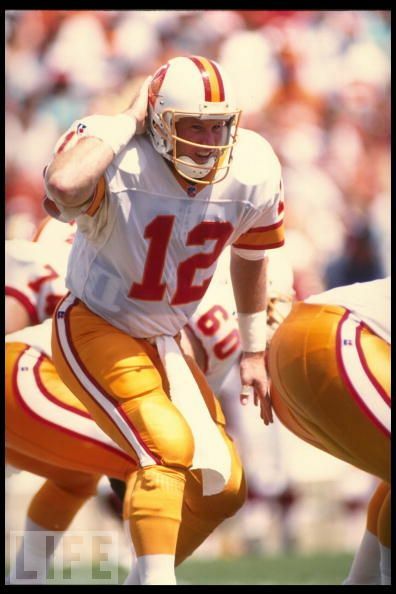 The Buccaneers from 1983-96 were pretty dismal, and if you’re going to lose, you better do it in uniforms like these. Many people hate these ones and although their current look is great and helped them get back to their winning ways, these ones have come back into style. So much so that in 2009, the Buccaneers brought them back for the first time since 1996 and won their first game of the year in them. They also scream Florida to me. If you’re a team from Florida, don’t you want to play in a sunny kind of uniform like this? I would think so. I think they’re great! This is the iconic Broncos look. The orange jersey with the blue helmet and white pants. True, the Broncos were not victorious in the Super Bowl with these, but they were for a long time the team’s easily identifiable look. Before these, the Broncos had an ugly history with brown jerseys and mustard-colored socks that were hand-me-downs from a college football all-star game played in Denver the previous year. In 1962, the teams colors changed to orange and blue and by 1968 the uniforms evolved into what they wore until 1996. The next year,the Broncos changed to a new logo and a darker blue with uniforms that resembled something from the NFL Europe league, but success followed upon the change with the two Super Bowl trophies that came with the change. 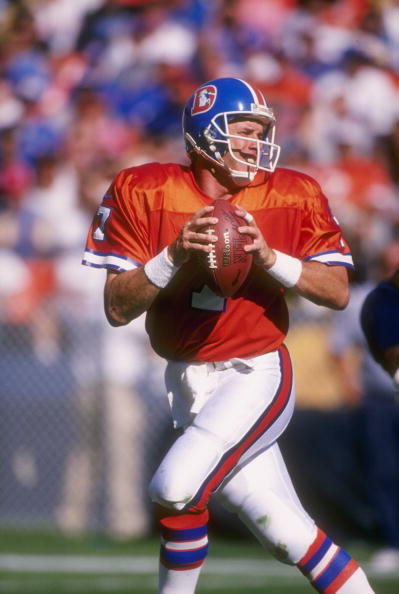 But the Broncos looked best in the Orange Crush uniforms. I love these uniforms. 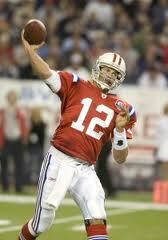 Although the Patriots current look is not bad, this logo and these uniforms should come back. The team’s look from the early 1960s and in the 1980s were great. The jerseys from the 1970s with the sleeve stripe weren’t a good look,though. That helmet with the minuteman in a three-point stance hiking a football is great. The red jersey with the shoulder stripes and the stripes on the helmet and pants are just fantastic, not to mention colorful. Robert Kraft, if you’re reading, please change the uniforms back to what they used to be. I had fun with the silver helmet and blue jerseys, but it’s time for a classic to come back. Many fans would probably agree with me on this one. I’m sure you will,too. This is the team that invented putting a logo on a helmet. The Rams have a great helmet with the horns on the sides, they look kind of like actual rams with them on. From 1973 to their Super Bowl winning 1999 season, the Rams had some great uniforms with the ram horns on the shoulders and the yellow pants. I also liked the yellow sleeves under the blue ram horns on the away jersey. 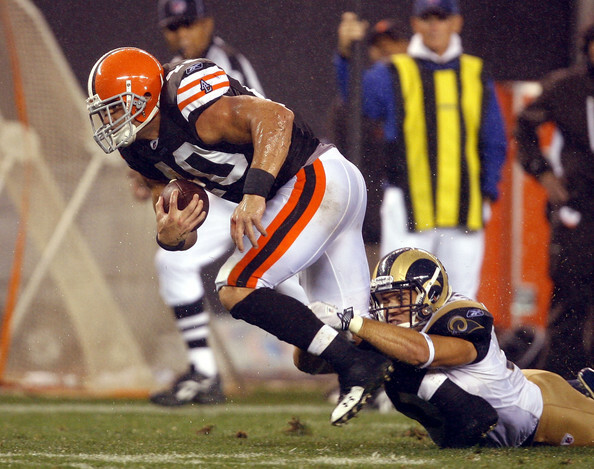 The Rams discarded these after 1999 and went to a darker look with a darker blue and gold. I liked them for a bit,but like many things, it’s the ones that already worked that I like. 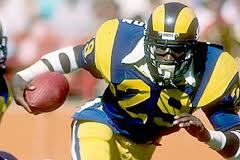 Yes, the Rams bring this look back a couple times a year, but they should wear them again full time. Before 1963, the Raiders had a look that was boring. They had a black helmet with nothing on it, black jerseys and gold trim. Nothing special. Al Davis came along and changed the whole look. 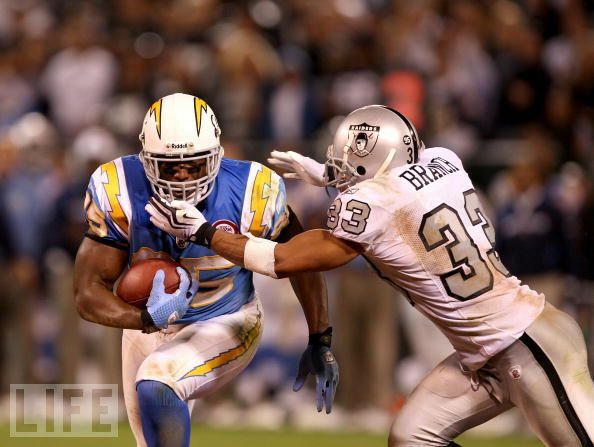 He went with a silver helmet, a black jersey with silver numerals and silver pants with black trim. A classic, yet simple look that fans have embraced. 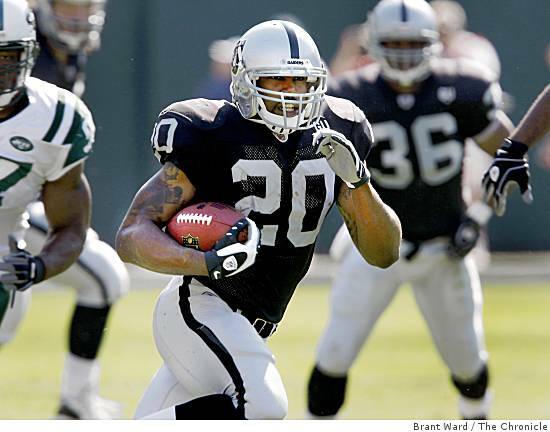 Could you imagine the Raiders in any other colors? I couldn’t. They’re not the best colors in the world, but for this team, they work and they look really good. This uniform has had few changes since 1964 and that’s a good thing. With today’s uniforms being as busy as they are, it’s nice to see the Raiders keeping their uniforms simple all these years. I know that Al Davis hasn’t done a lot right in recent years, but these uniforms as is are one of the things he has going for him. Beautiful,man! The powder blue Chargers uniforms from their AFL days onto the early 1970s were some of the best uniforms in league history. I love it, the colors, the yellow lightning bolt, the numbers on the side of the helmet. It’s great! And it’s great for a city like San Diego because those colors scream San Diego, they say to me, this is a place where it’s 72 and sunny year round. If the Chargers were from West Virginia, the colors wouldn’t work well there, but for a team in San Diego, they’re perfect. Plus I love how colorful the AFL was back then. That’s one area where they had the NFL beat, and the Chargers were part of that. In 1974, the Chargers went to a darker blue that just didn’t (and still hasn’t) do anything for anyone. It just doesn’t look very good and I think it’s time for the Spanos family to recognize that the Chargers look good in the old look. Not the fancy ones they have now, but the old,old look from the AFL. It’s just awesome! This is the best look the NFL has going for it. The Steelers current uniform, which has been in use since 1968, is a winning look. The iron black helmet with only one decal on it. The black jersey with gold sleeve stripes that are iconic and the gold pants are just awesome. Although the block numerals went away in 1997, I still like seeing this uniform every week, and it’s been worn through six championships and by many legendary players. From Bradshaw to Roethlisberger, from Harris to Bettis, from Swann and Stallworth to Ward and Wallace. This uniform is by far the best and will continue to be for many years to come. That’s it,that’s the list, did I leave someone off? Let me know!